Gentle elevation helps alleviate the pain or numbness sometimes caused by lying flat on the back.The bed wedge that we have is the 10 inches wedge - it has an elevation lift of 22.6 degrees, and can be easily placed in or on your bed. 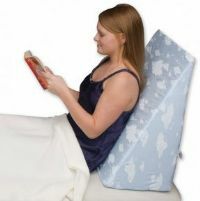 The best time to use the bed wedge, other than sleeping on it includes using them to read, watch television, or even to prop oneself up for conversations with your friends and loved ones. I am 23 weeks pregnant with my first child and found out this morning I have a sinus infection. Instead of canceling my prenatal massage I kept the appointment and my massage therapist used this pillow during the massage. It's been about a week since I had a full night's sleep without coughing for a few hours in the middle of the night. I laid back on this pillow for an hour, didn't cough once and actually fell asleep. Now, here I am about to purchase one because I think it will be extremely useful even after I have the baby. No more sleepless nights for me or my poor husband!